What’s the best thing to wear on your hands when sea kayaking in very cold weather? 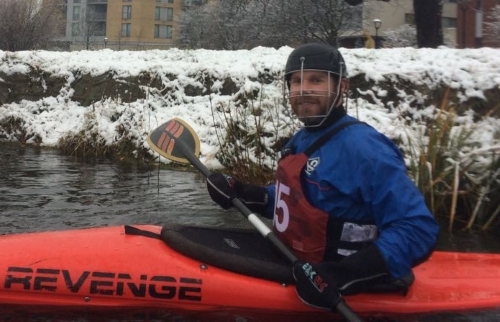 What product or combination of products best protects your hands while kayaking in winter? I’m interested in a system which provides comfort for extended paddling but also the peripheral activities including possible self or assisted rescues, in water temperatures close to freezing and air temperatures down to perhaps 14F / -10C. Assume for the sake of this question that appropriate safety precautions are taken. The best answer I’ve come up with so far is to combine neoprene paddling gloves such as those sold by NRS with an additional pair of waterproof or semi-waterproof mitten shells designed to be worn over gloves / mittens. This has kept my fingers completely comfortable in air temperatures well below freezing while paddling through rivers or bays where ice is forming on the shores. I was able to grip the paddle well and could briefly remove the mitten shells while leaving the gloves on to adjust helmet strap attach sprayskirt etc. I found this system better than neoprene mittens which constricted finger spreading and cramped my hands after hours of paddling. I have not attempted whitewater-style pogies (a sort of palmless neoprene mitten that attaches to the paddle and allow excellent paddle grip) in weather that cold. Update: Another answer suggests pogies (see below). I should clarify that I have not experimented much with them because I prefer a Greenland paddle and like to do some strokes where I move my hands around to different parts of the paddle. Pogies may be a great solution for people with a different paddle and/or technique. Also the particular paddle I use has a shape, wood grain, and varnish that affords excellent grip so I don’t experience hand fatigue even with overmitts, this may be a very real issue with other paddles, which pogies may help avoid. 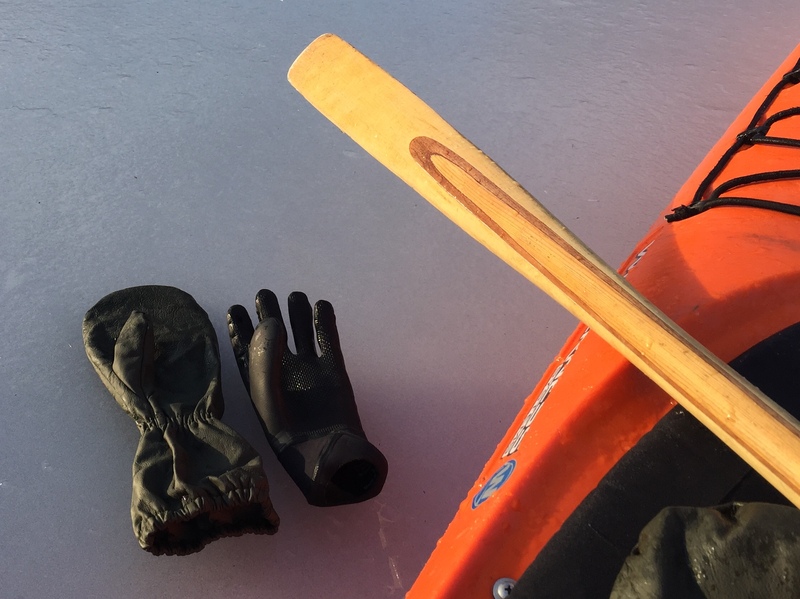 I haven't been paddling much for several years, but I used to go all winter with simple fleece gloves inside waterproof dishwashing rubber gloves. I tried a half dozen other alternatives, including wetsuit gloves, other waterproof gloves, pogies, etc. Fleece insulation and waterproof outside worked best, and was also very inexpensive. Sometimes known as paddle mitts, pogies are your friends here, you can choose to wear gloves in them as well or not, depending on how cold it's got, but most importantly they allow you full contact with the paddle and hence you don't get the extra fatigue caused by a reduced level of paddle control. Pogies range from a simple nylon shell that keeps the wind and water off through chillcheater aquatherm and neoprene all the way to full waterproof fleece lined with cuffs you can tighten (with your teeth) to stop water running in from the top. There's a pogie for every event. They're also available for rowers, windsurfers, cyclists, motorcyclists and even pushchairs! Not the answer you're looking for? Browse other questions tagged winter sea kayaks paddling or ask your own question. How to maximise the chances of survival when stranded in open sea? What's that stinging feeling when I swim in the sea?